Hal Reid got a chance to put the Pharos Drive GPS 250 through its paces in the big city and the outskirts of town. He found quite a lot to like in the mid-range ($299) offering including some cool features such as the appearance of large black arrows when it is time to turn and crossed victory flags when you have reached your destination. Could this be the satellite navigation device for you? I had more opportunities to travel around with this device than with others I have reviewed. This device traveled from middle Georgia to Auburn University in central Alabama twice (different routes), to the Ham Radio Outlet in Atlanta - which I can never find the first time, and then around Medford and Grants Pass, Oregon. Finally, it went to and from Macon, GA through some areas of Jones and Baldwin counties I had never seen before. The drive was about 35 miles round trip, and I took some side roads with which I was unfamiliar. It is an easy device to use and it always took me where I wanted to go, with one exception: the ham radio outlet in Atlanta. The store, it turns out, is really in a town called Doraville, a suburb of Atlanta and I didn’t know that. User error. It comes with a stylus, which fixes the "fat finger” problem when poking the screen. The default voice is very understandable and pleasant - it is just slightly metallic, making it sound high tech. The address book feature for storing routes is very easy to use. You can just point to a place on the map and it will route you there. The map rendering is very good. You can set it to let you know when you are close to a location that exists in the address book. You can block out roads that are not fun to drive. If a road is blocked some distance ahead, you can ask for a detour and it will re-route around the problem area. You can preview the route - it lets you see and hear the directions before you go. It comes with a pouch - a nice one at that. With most navigation devices, this is typically a $20 option from a third party vendor. But it’s a necessary option because you won’t want to leave your navigator on the dash when you park the car. Plus, you’ll need to protect the screen from scratches. So a pouch is really a necessity and should be part of the deal. It has a walking mode, and you can use the pouch to attach it to your belt while walking. Entering house numbers in the "Go To" address dialog can occasionally be problematic. If you have the wrong city (Atlanta vs. Doraville), the house numbers don’t work and there is no way to tell, as in my case in a suburb of Atlanta, whether the business has an Atlanta address. It only routes point to point, not to multiple stops. The SD chip that contains the maps can’t be removed without voiding the warranty, which I found strange. You can look up the technical specs here. This is a very clean looking device. There are only five user accessible items on the device: the USB/power port, an earphone port, an external antenna port, the on/off switch and the reset button. There is also a slot for the stylus, and a suction cup attachment to attach it to the windshield. Most people will use just the USB/power port and the off/on switch. It is simple, easy to use and very straightforward. Not counting the primary Go!, Map, and Settings buttons, there are a total of 25 menu choices. As the diagram below illustrates, these 25 choices are divided into nine menus for "getting there,” and 16 for the settings that let you adjust what the "getting there" experience is like. Figure 1. This is the initial menu selection that appears right after the device boots up. Figure 2. These are the selections that appear under the "GO" menu. New Address lets you enter a new address or location destination. Recent Place includes somewhere you have already been. Points of Interest (POIs) are selections of the types of POIs you want to see - gas stations, restaurants, etc. 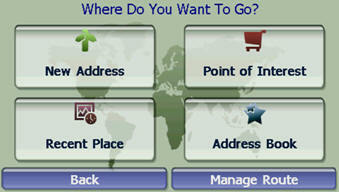 Address Book is where you save the locations you will want to route to again. Figure 3. Managing your route. Turn by Turn lets you see each step of the way. Cancel Route does what it says. Route Overview is a map of the entire route. Avoid Roads let you set the roads you don’t want to traverse. 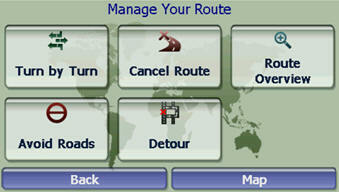 Detour lets you set a detour within a distance of something you want to avoid. Figure 4. Options - Night View, 2D View and Map Display set up how the map looks. Night View tones the display down so it is easier to see at night; 2D provides a standard map view - as opposed to oblique in 3D - and Map Display determines how the labels look (if up is north, etc.). Map Browsing lets you explore the map without a route. Walking Mode zooms the map way down. Figure 5. Setup - Units of Measure, Language, Time Settings are self-explanatory. Quick Nav takes you to a pre-defined address or the nearest POI. Look and Feel lets you apply different skins to the map (downloadable), the keyboard and auto day/night view. Select Map has regional and national map choices. Figure 6. More Setup - Brightness sets the display. 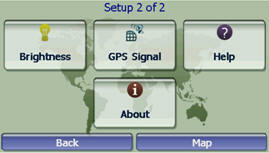 GPS Signal tells you the current lat/long, speed, altitude and number of satellites. Help is self-explanatory. About is the software version. This device is one that just continues to grow on you. Right now it is sitting on the edge of my desk being charged, with a very poor view to the outside. It has locked on to five satellites, has a reliable GPS signal and is ready to navigate somewhere. The screen is large and readable, and the display easily dims for night use. The high tech voice gives the impression that she knows where she is going and she made me feel confident, even when we were out in the boondocks of Jones and Baldwin counties in the middle of Georgia. It did find the fastest route and perhaps the most scenic. 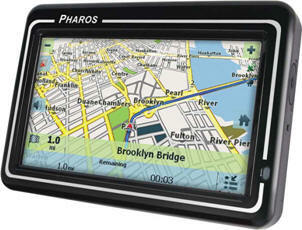 The Pharos Drive GPS 250 is a good choice in the mid-range of personal navigation devices.